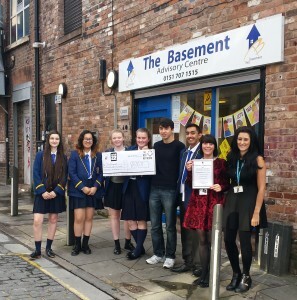 Young people fundraise through national citizen service for Liverpool homeless charity, The Basement. The Catch22 Liverpool and Knowsley branch of NCS (National citizen Service) raised a massive £630 for the Basement Advisory Centre, through a range of creative fundraising events. The young people in the group aged from 15 to 17 years, took ownership over coming up with a range of innovative ideas that would encourage people to part with their hard earned cash in order to support vulnerable homeless people in Liverpool. Events included a fundraising day at St Luke’s (Bombed out) Church as well as a 9 mile walk along the promenade from Otterspool to Liverpool City Centre and back. After the group’s hard work (and sore feet!) they celebrated their achievements at an official NCS regional ceremony which declared them as one of the groups in the Merseyside area to raise the most money for a charity. “The young people wanted to help those less fortunate than themselves in their community and felt that by raising money for The Basement, they would be able to make their mark on our city, where there are so many people in need of the help and support that The Basement offers.